In order to increase your audience, you need to maximize the effectiveness of your podcast, and the following tips can help you do that. Before recording your podcast, it’s a good idea to write a script. This way, you will be able to accurately convey your thoughts or information without too many filler words (uhs, ums, etc.) and without talking in circles. Plus, by reading off of a script, you will not have to spend as much time editing your podcast, and this can be a great time saver for you. When your podcast is clear and concise, your audience will be more likely to tune in and enjoy what it is you have to say. 2. Ensure your audio is easy to hear. When you record your podcast, make sure there isn’t any background noise. If there is too much background noise on your podcast, it can be distracting to your audience, and they may stop tuning in. It’s also a good idea to ensure the quality of your audio is impeccable. Make sure there is no static and make sure your audio is easy to hear. If anything negatively affects your audio, it will keep your audience from coming back. 3. Allow your audience to share your podcast. Word of mouth marketing is essential for the success of your podcast, so make sure that you are allowing your audience to easily share your podcast with others. Set up your podcast to include widgets that allow your audience to share your podcast via email or social network with the click of a button. If your audience likes what they hear and sends it off to their friends, you will greatly increase traffic to your podcast and hopefully recruit some more avid listeners. 4. Invest in social media. Social media can be a great tool for your podcast. Make sure you have social media accounts set up and use them to push out blurbs and information from your podcast. Your audience may be intrigued with something they see on your social sites and use it as a reason to click through to your podcast and give it a listen. Try to determine which social networks your target audience uses most often and start with those. Then, you can move on to other social networks to increase your reach. Your podcast may be a fun tactic for your audience, but podcasts alone don’t excel at search engine optimization. 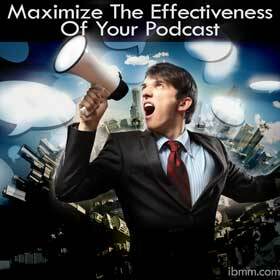 In order to increase the effectiveness of your podcast, you need to be found online. Search engine optimization is one of the best ways to do this, but you will be unsuccessful unless you transcribe your podcast. Search engines crawl through websites in search of keywords, and they use those keywords to rank websites appropriately. Search engines, though, cannot crawl through podcasts, so any keywords used on the audio file will not help your SEO. However, search engines CAN crawl through transcriptions, so if you transcribe your podcast and place the transcription on your website, you will greatly increase your SEO. And don’t worry. You don’t have to transcribe your podcast yourself. You can easily locate a podcast transcription service with a quick turnaround to do the work for you. You, simply, will just improve your SEO. This is awesome! I was recently thinking about doing a few podcasts and here I am reading an awesome and resourceful post. Thank you for sharing. I am sure some of the tips I've picked up from here, are going to help me plan my work better. I love these tips and of course I'm a huge fan of podcasting too. Typically I don't write out a script but I do make an outline. I also find that I tend to write a blog post that compliments the podcast but not actually a transcription, but you're right I need to do both. I guess whether using an outline or writing a complete script depends on experience. For the first few Podcasts a script might be a great help. Plus, a podcast aiming at selling a specific product might get a better response if carefully scripted. I know some of the high-ticket gurus actually have complete scripts for their webinars, although they don’t make it obvious. Thanks for sharing the article, Ileane.